Almost from the moment we start Taekwon-Do (TKD) as a white belt, we are told that we must practise kicking with both legs equally. In fact, we are often told to spend more time practising with the weaker leg. For the majority, the weaker leg is the left. Most students who reach 1st degree black belt and subsequently learn Ge-Baek Tul will have noticed that in this pattern there is a definite and quite obvious bias towards the right leg. This will be especially noticed by left-legged people. This article will show that there is an inherent bias towards the right leg throughout the patterns in TKD. While those who reach 1st degree will notice the right-leg bias in Ge-Baek, many may not have noticed the bias in the colour belt patterns. Some patterns are symmetrical - that is to say that every move performed with the right side is also performed with the left, and vice versa - and the first few patterns we learn are symmetrical. A symmetrical pattern, by definition, cannot have a bias towards the right leg over the left. The first six patterns we learn are symmetrical (or nearly symmetrical). 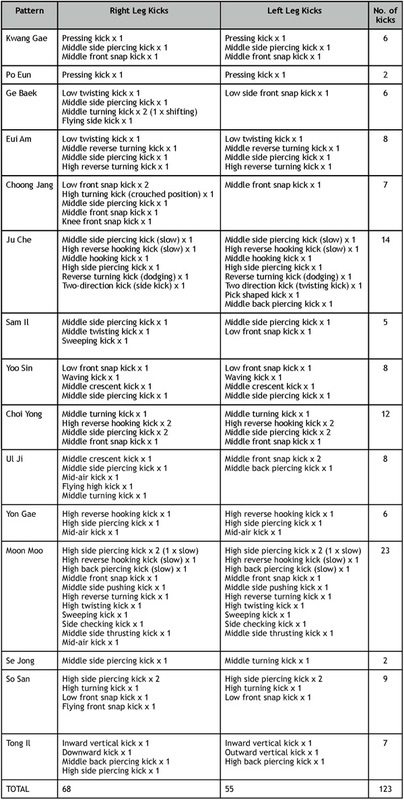 Chon Ji and Dan Gun do not contain any kicks, while Do San, Won Hyo, Yul Gok and Joong Gun contain equal right- and left-leg kicks. Toi Gye is the first pattern in which we see a bias. Of the four kicks in this pattern, three are with the right leg. Both legs perform a low-section side front snap kick, but the right leg also gets a middle-section front snap kick and a knee upward kick. Hwa Rang is the next example. While the turning kicks are equal (one with the right and one with the left, both high section), there is also a single middle-section side piercing kick performed with the right leg. Choong Moo gives us our next example in the colour belt patterns, and this is much more obvious. In fact, I’m surprised that I’ve never really thought about it and properly noticed it before; perhaps that’s precisely because I’m right legged. At the end of Choong Moo there are two middle-section side piercing kicks - one with the right and one with the left. Move 14 is a high turning kick with the right leg, balanced out with move 17, which is a middle turning kick with the left leg. The bias, however, is at the start. The 7th move is a right-leg middle side piercing kick, and the 9th move is a right-leg flying side piercing kick. There are no equivalent left-leg side kicks. To try to “balance things out”, there is a middle-section back piercing kick for the left leg at move 15 but, in my opinion, this pattern certainly favours right-legged people. And let’s not forget the right-leg knee upward kick at move 12. We can now see that there is a definite bias towards the right leg in the colour belt patterns; 59% of the kicks are with the right leg. Or, to put it another way, there are 45% more kicks with the right leg than with the left (11 x 145% = 16). But, there are only 29 kicks in the colour belt patterns. Rather a small number to draw any firm conclusions about TKD patterns as a whole. Let’s now look at the black belt patterns, where the number of kicks increases. The first two black belt patterns (Kwang Gae and Po Eun) are symmetrical, and contain equal kicks on the right and left sides. But when we get to the third and final 1st degree pattern, Ge Baek, the symmetry is lost and the bias towards the right leg is quite astonishing. For the right leg, there is a low twisting kick, middle side piercing kick, two middle turning kicks (one of them is while shifting) and a flying side piercing kick. For the left leg, there is a single low side front snap kick. The first 2nd degree pattern, Eui Am, is symmetrical. The next pattern (Choong Jang) is not, though. 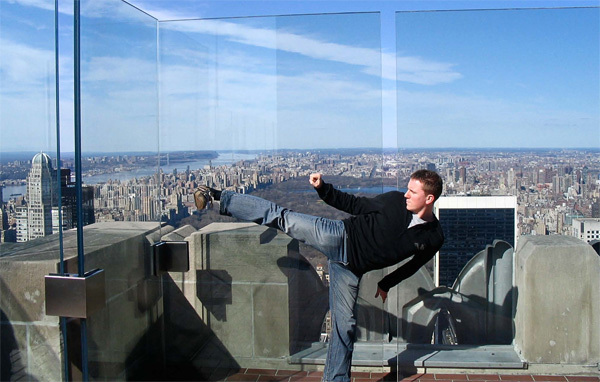 For the right leg, there are three low front snap kicks (one with the knee), a high turning kick (from a crouched position), a middle front snap kick, and a middle side piercing kick. For the left leg, we again find a single front snap kick (middle section). Juche, the third 2nd degree pattern, is one of the most difficult patterns in Taekwon-Do. It is broadly symmetrical, except for a few moves, and this is the first and only pattern where we find more kicks with the left leg than with the right. Kicks the left leg performs that the right leg doesn’t are a pick-shape kick and a slow-motion middle back piercing kick. Does this make Juche biased towards lefties? I don’t think so, because there is another asymmetry in the kicks. This is in the form of a flying two-direction kick, with the right leg performing a side kick and the left a twisting kick. This kick may seem even at first, but in my opinion it is much easier for righties to perform than it is for lefties. This is because it is a left leg take-off, and is performed in a very similar manner to a right leg flying side kick. Being a rightie, I personally find that doing a two-direction kick the other way around is very tricky. I would therefore say that while Juche has more kicks with the left, overall it is about even in my opinion. The picture improves slightly with the 3rd degree patterns, although we still find a right leg bias in Sam Il. 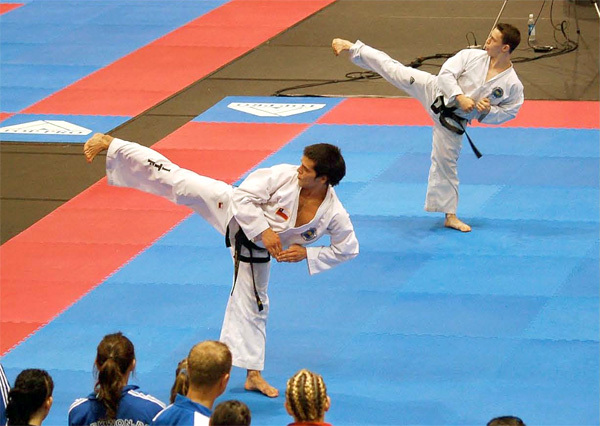 Both legs perform a middle side piercing kick, but for the right leg there is a middle-section twisting kick and a sweeping kick, while the left leg has a low front snap kick. Yoo Sin and Choi Yong are, however, both symmetrical. As we move on to the 4th degree patterns we still find a right-leg bias. In Ul Ji, the right leg again performs more kicks than the left. 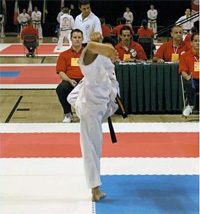 With the right leg, a middle crescent kick, middle side piercing kick, mid-air kick, flying high kick and middle turning kick are all performed. The left leg has only three kicks: two middle front snap kicks and a middle back piercing kick. Yon Gae is a symmetrical pattern and is therefore without bias to one leg, and the same is nearly true of Moon Moo. Nearly. Moon Moo is almost entirely symmetrical, but move 58 is a mid-air kick with the right leg, which isn’t repeated with the left. We now move to patterns with which I am not familiar, namely the two 5th degree patterns (Se Jong and So San) and the 24th and final pattern in Taekwon-Do (Tong Il) for 6th degrees. I can, however, comment on these patterns by studying the lists of moves. Se Jong has only two kicks: a right leg middle side piercing kick and a left leg middle turning kick. So San, though, has an odd number of kicks, with the right leg getting a flying front snap kick that is not performed with the left. Finally, with Tong Il, both legs perform a back piercing kick (middle section for the right leg, high for the left) and an inward vertical kick. The right leg performs a downward kick, but this is balanced by an outward vertical kick with the left leg. The balance is lost when the right leg performs one kick more than the left leg, a high side piercing kick. The picture is now much clearer, having counted the kicks in the black belt patterns. Of the 123 kicks (noting that we have counted the flying side-twisting kick in Juche as two kicks), 55% are with the right leg and only 45% with the left. Overall, combining the colour belt and black belt patterns, there are 152 kicks. 85 (56%) are with the right leg and only 67 (44%) are with the left! But why the obvious bias? Perhaps General Choi and the other masters and pioneers who designed the patterns were right legged themselves. Or, perhaps there are good reasons for more right leg kicks, similar to the reason that Choong Moo finishes with a left hand attack. I rather suspect that it’s the former. If so, then was it done deliberately? I doubt it. It was probably something that was simply overlooked. 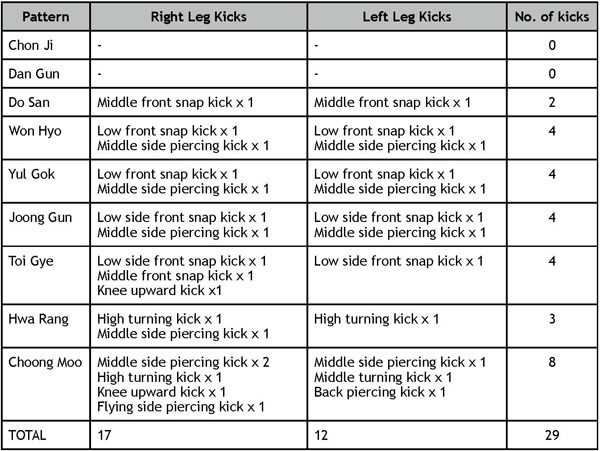 We’ve seen that there is a right leg bias in the TKD patterns; but that looked primarily at the numbers of kicks in the patterns. What about the difficulty level of the different kicks. As you may have noticed, in several patterns the left leg often seems to get the simple front kick, while the right leg gets kicks of a greater difficulty (see Ge-Baek, Choong-Jang and Ul-Ji). Looking closely at Gye Baek, we know there are six kicks: five with the right leg and one with the left. But, can we really say that the left-leg front kick “offsets” one of the right leg kicks, to give a difference of four, when we know that the right leg has to perform kicks such as flying side kick and dodging turning kick? 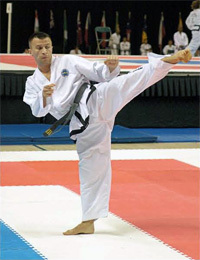 Clearly, the only kick given to the left leg in Gye Baek Tul is one of the easiest kicks to perform. Is there any way, therefore, to examine the difficulty of the kicks given to the right and left legs? And would it show an even greater bias towards the right leg? Well, let’s try giving each kick a nominal score related to its difficulty. You may disagree with some of these scores (I haven’t taken infinite care when assigning them) and therefore you may want to try this process yourself, giving your own difficulty scores to the kicks. 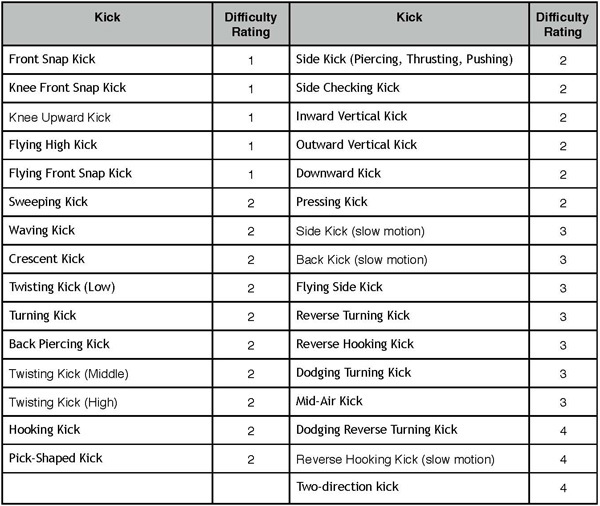 We can then apply these scores to the kicks in the patterns, by seeing how many of each kick are featured and with which leg. We start with the colour belt patterns. We have already seen that there is a 59%-41% split in favour of the right leg in terms of the number of kicks. Will this relative difference change when we take into account the difficulty of the kicks? Surprisingly (or perhaps not), the relative difference is the same, at 59% for the right leg and 41% for the left. The total difficulty score for the right leg is 27, while for the left it’s 19, and 27 plus 19 gives 46. 27/46 = 0.59 19/46 = 0.41. This means that for the colour belt patterns the bias to the right leg in the number of kicks is reflected in the difficulty of the kicks. So, we don’t see the predicted increase in bias to the right leg. Perhaps we will in the black belt patterns. We’ve seen the 55%-45% bias to the right leg in the number of kicks in the black belt patterns. Will this relative difference increase when we analyse the difficulty levels? We again find that the relative difference is almost the same. The split is now 57%-43%, which is a slight increase towards the right leg, but not a large difference from what we saw with the numbers of kicks. The total difficulty score for all patterns is 284. Of this, the right leg gets a score of 163, while the left gets a score of 121. This gives an overall split of approximately 57%-43%. Again, this is a slight increase over the 55%-45% split we saw in the numbers of kicks, but not a large difference. It therefore seems that the bias towards the right leg is fairly consistent throughout the TKD patterns. In the overall analysis, we have seen that the left-leggers are certainly at a disadvantage in patterns. Download this article in PDF format (PDF, 1,328 MB).